This WordPress tutorial teaches you how to create an XML Sitemap in WordPress and submit it to Google Search Console. After submitting your WordPress URL to Google search engine, the next thing you need to take care is to create an XML Sitemap for your website. The good thing is that in WordPress, there are several plugins using which you can submit an XML Sitemap to the Webmaster tools like Google and Bing. An XML Sitemap contains the list of all the pages and posts inside your Website and by submitting it to different webmaster tools, search engines will know about all the web pages on your site and helps in better crawling and faster indexing of your website. If you have a new website or blog, Sitemaps helps your website get found on the search engine as it is a great planning tool for Search Engine Optimization (SEO). I will advise you to take a look at the important article on why you should build a sitemap even before designing your website. To generate a sitemap, you need to install and activate WordPress Yoast SEO Plugin. Now, on your WordPress Dashboard, you’ll see the Yoast SEO option. Hover over it and go to XML Sitemaps. On the next screen under XML Sitemaps – Yoast SEO, change the XML Sitemap functionality from Disabled to Enabled. It will show you different Settings to configure for your Sitemaps. You can select post types you want to include in your sitemap and exclude posts which you don’t want to add to your sitemap. If you are not sure what to do with the settings, just ignore all the fields. Finally, click the Save Changes button at the bottom. Now, the plugin will automatically generate the Sitemap for your WordPress website. 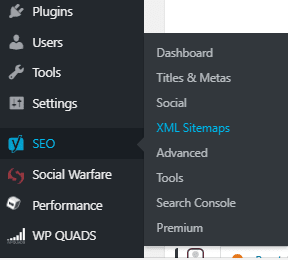 You can access your sitemap page by clicking on the XML Sitemap button. Or you can simply add the URL sitemap_index.xml after your domain name to view the Sitemap page. After generating the sitemap for WordPress, the next thing you need to do is to tell Google about your Sitemap URL. You can do so by using Google Webmaster tool. I am assuming you have submitted your property to google webmaster tools and verified your site successfully. If not, complete this step first using the link provided at the top of this article and then proceed. On google webmaster tools, select the property for which you want to add the sitemap URL. 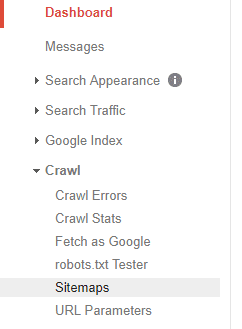 On the left side, you’ll see the dashboard, go to Crawl > Sitemaps. Click on ADD/TEST Sitemap button at the top and enter your Website’s Sitemap URL. i.e sitemps_index.xml. Hit the Submit button. The sitemap will be added successfully. 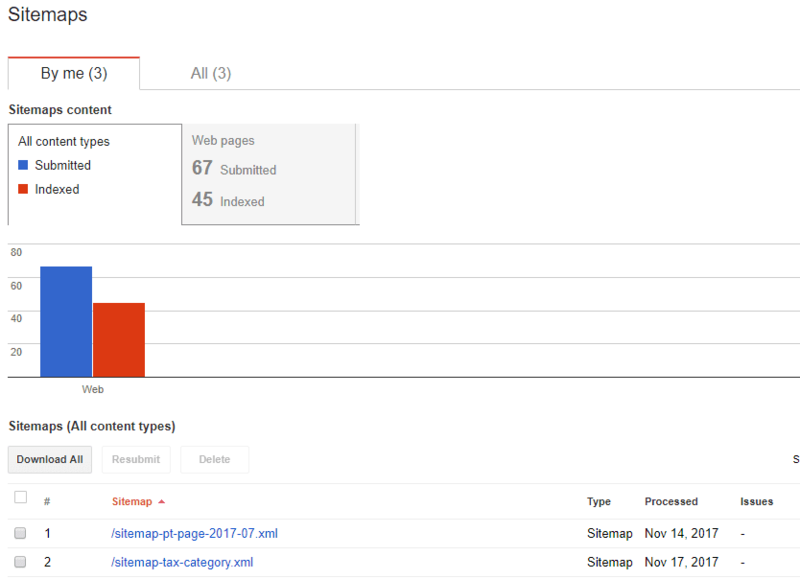 Your sitemap status will be shown as pending in the beginning. Google will take time to show your indexed stats on google webmaster tool. Google will fetch your page URL and could take over a few weeks time before start displaying the stats as shown in below screenshot. 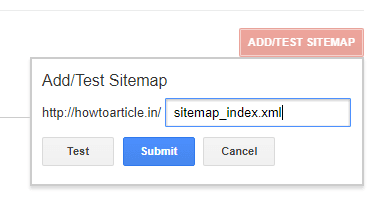 If you have any doubts or queries regarding generating XML sitemap in WordPress and submitting the Sitemap to Google, feel free to ask in the comments section below. Share this article with your Facebook friends, twitter and google plus followers.